Balance HMB 500 provides pure Calcium ß-Hydroxy ß-Methylbutyrate. HMB is an important anti-catabolic supplement that has shown to support the body's ability to minimise protein breakdown and damage to muscle cells that can occur due to intensive exercise or muscle trauma. 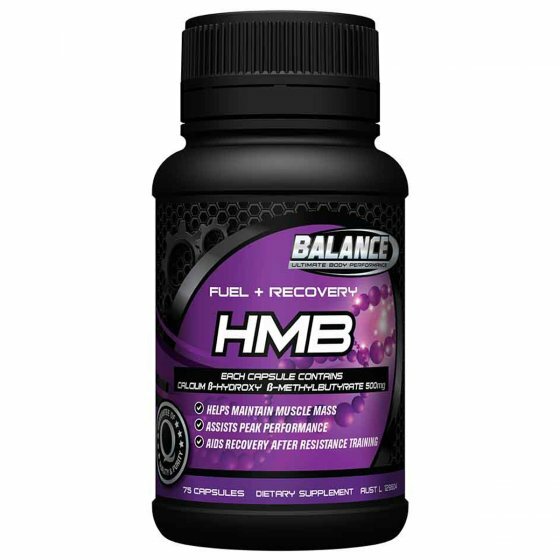 Balance HMB capsules are intended as a supplement for athletes in a catabolic state to aid muscle growth and maintenance. HMB is an important anti-catabolic supplement that has shown to support the body's ability to minimise protein breakdown and damage to muscle cells that can occur due to intensive exercise or muscle trauma. HMB is a metabolite of the essential Branched-Chain Amino Acid (BCAA) L-Leucine. Formulated without: Added yeast, gluten, lactose, dairy, flavour, colour, artificial sweeteners, soy, egg, fish, corn, preservatives.